In its press release dated 25th of January the Commission de Surveillance du Secteur Financier (“CSSF”) has brought significant information regarding the impact of Brexit on (i) the delegation of investment management/portfolio management and/or risk management activities to undertakings in the United Kingdom and (ii) the temporary permissions regimes (“TPR”). The CSSF press release follows the announcement made on the 7th of January by the Financial Conduct Authority (“FCA”) regarding the opening of the notification window for the TPR. The notification window will close on the 28th of March 2019. 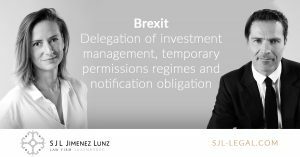 The CSSF has reminded that within the context of a “no deal” Brexit, delegation of investment management/portfolio management and/or risk management activities to undertakings in the United Kingdom (considered so as a “third country”) were allowed according to the legal provisions of the Luxembourg fund legislation (in particular Article 110 of the Law of 17 December 2010 on undertakings for collective investments, Article 18 of the Law of 12 July 2013 on alternative investment fund managers and Article 42b of the Law dated 13 February 2007 on specialised investment funds), under specific conditions i.e. : (i) these undertakings are authorised or registered for the purpose of asset management, (ii) are subject to prudential supervision and that (iii) cooperation between the FCA and the CSSF is ensured. Regarding the operation and marketing by firms and investment funds established in Luxembourg in the United Kingdom, the CSSF has reminded that a TPR has been operating since 7 January 2019. Under the TPR, firms and investment funds having notified the FCA are authorised to continue new and existing regulated business within the scope of their current permissions in the UK for a limited period of maximum three years after 29 March 2019 while seeking full FCA authorisation. The TPR includes, among others, authorisation of the inbound marketing of EU funds in the United Kingdom. In order to be able to operate under the TPR, firms and funds are required (i) to notify the FCA of such intention before the 28th of March 2019 and (ii) to duly inform the CSSF of any notifications made under the TPR, as soon as it has been submitted to the FCA, by sending an email notification to a dedicate email address. The FCA has warned that once the notification window will have closed, fund managers that have not submitted a notification for a fund will be unable to use the TPR for that fund. Last but not least, the CSSF has reminded that there is also a TPR for other financial institutions, including banks, which offer the possibility to continue operating in the United Kingdom for a limited period after Brexit. The notification deadline is 28th of March 2019. Financial institutions should further refer to the emergency action plan adopted on 19 December 2018 by the European Commission and to the publications by the European Banking Authority and the European Central Bank, providing appropriate guidance to anticipate for Brexit issues. Our investment management team is pleased to assist you on any queries on the foregoing.